Twenty-two years of tradition, three masters of gourmet cuisine, seven countries, 10 days for lovers of good eats, three host cities, 27 restaurants, 30 guest chefs, 18 grand culinary events and three tasting and lunch workshops. 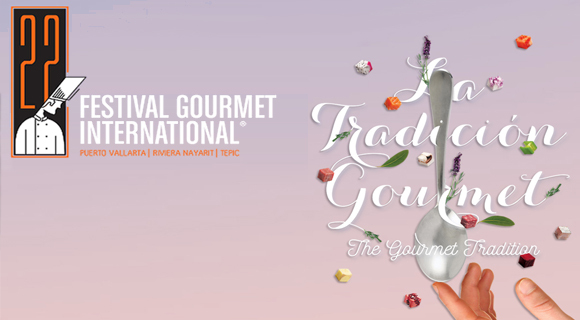 The XXII Festival Gourmet Internacional Puerto Vallarta-Riviera Nayarit-Tepic will take place November 11-20, 2016. The gourmet tradition par excellence is back! The so-called “Three Musketeers”— Thierry Blouet, Heinz Reize and Roland Menetrey—announced that everything is ready once again for the gastronomy of this region to headline a festival of flavors. “For 22 years the Festival Gourmet has stirred the gastronomic pot in this region, 22 years that fine dining has completely renewed our culinary offerings and our destinations of Puerto Vallarta, Riviera Nayarit and, more recently, Tepic,” said Heinz Reize. “This dream began with a lot of hard work. This year the program is awesome and very interesting with lots of new events; it truly is one of a kind. This is the only event on a national level of this scale and the only one that involves all of the destinations’ restaurants,” commented Thierry Blouet. Twenty-two years of tradition, three masters of gourmet cuisine, seven countries represented, 10 days for lovers of good food, three host cities, 27 restaurants, 30 guest chefs, 18 grand culinary events and three tasting and lunch workshops. Each participating restaurant will accommodate a national or international guest chef, who will offer their creations alongside the local host chefs. Throughout the history of the festival it has had the participation of over 500 top national and international chefs and over 500 thousand dinner guests have enjoyed the pleasure of their culinary delights. The first edition took place in 1995 with only six hotels and six restaurants. For a look at the program in detail visit www.festivalgourmet.com.